Today we took my son back to college, and we stopped at Blue Ribbon Diner in Mebane, North Carolina. It's right off I40 and about 20 to 30 minutes from UNC-Chapel Hill. If you're headed up I40 from Greensboro to Chapel Hill, you get off the Mebane exit and then turn left. The restaurant is about 1/3 mile on the left. And, they have a sign on the highway too. It's easy to find. 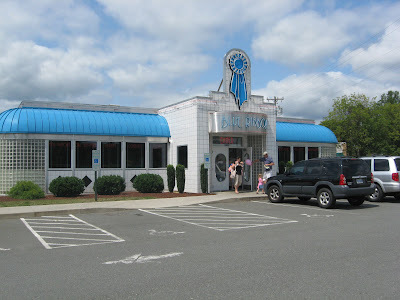 The original Blue Ribbon Diner is in Burlington which is a little further South of Chapel Hill. Business was so good at that restaurant that the two men who opened up Blue Ribbon decided to open the second location. Jennifer, our waitress who was absolutely terrific, told us that she used to eat at Blue Ribbon when she was a kid. "It got hot standing outside in line," she told us. 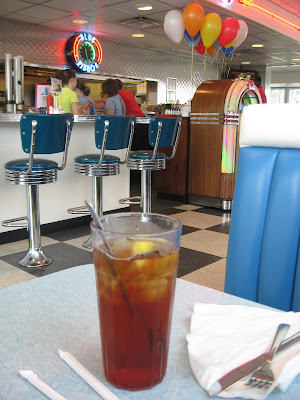 And, she's glad they opened up a second diner so that they can feed all the folks looking for a delicious diner meal. 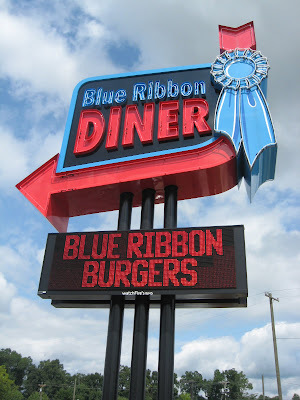 Although, Blue Ribbon is called a diner, it's heavy on the burgers, hot dogs, and chicken sandwiches with the specialty being the grilled chicken sandwich (more about that later). They also sell a lot of the "Dirty Dog" which is a big weiner with chili, cheese, bacon and slaw. 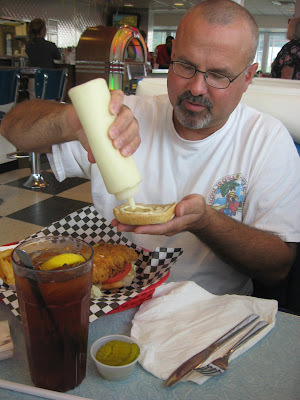 The guys thought that sounded good and may order the big hot dog next time. In diner tradition, Blue Ribbon has blue plate specials ranging from chicken fried steak to homestyle meatloaf. Sunday is the day for chicken pie, and if I had not eaten so much barbecue over the winter and put on a few pounds, I would have loved to have tried that with the two Southern sides. I saw some of the sides go by, and they looked great. They included traditional dishes like mashed potatoes, fried okra, pinto beans, and blackeyed peas. Yum. I'd also note that most of the sandwich plates came with unlimited french fries. I had plenty, but that might be good news for those with big appetites. They're kind of thick steak fries with a bit of crinkle. Ours were piping hot and nice and crisp. Here's a fried chicken sandwich. I tried a bite of that. Very tasty. And, the toppings (lettuce and tomato - although you could get gravy on there if you wanted) were super fresh. The tomato looked like local home grown, and the lettuce appeared to be fresh off a full head of iceburg. 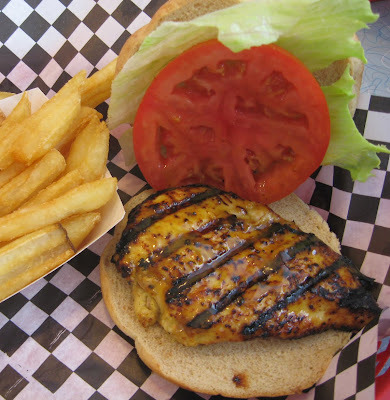 I had to try the diner specialty - the grilled chicken sandwich. Jennifer told me that it had a fabulous apple jack sauce on it and that the chicken was sweet but not over the top. She was absolutely right. The balance was perfect. Plus, the chicken was moist and juicy. It was one of the best grilled chicken sandwiches I've ever had at a restaurant. I usually grill chicken at home. If you're ever on I40 between Greensboro and Raleigh, then check out the Blue Ribbon Diner. Or, take a side trip and check it out. The grilled chicken sandwich is out of this world, and the other meals passing by looked great too. After that fun lunch, we headed on to UNC-Chapel Hill where I helped the kid move his stuff up to the 10th floor of Morrison. There are more people in his dorm than in our home town. He does have a good view of the trees which will make him feel more at home I hope, and he has a suite with 6 roommates and a living room. Mebane is my hometown and whenever I'm home for a visit I alway try and make it by Blue Ribbon. Definitely one of my favs! Their cheeseburgers are yummy as well! My dad gets the apple jack grilled chicken platter from time to time and just loves it! Hope your son is getting all settled in nicely by now!